Mackenzie joined Youth Challenge as a summer program staff employee in 2012 and is currently the Program Manager at YC. Mackenzie is the main contact for all participants and their families and she manages daily program operations, including part-time staff and transportation services. She also oversees college internships. 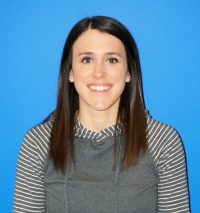 After completing her graduate course work, including a 12-week internship at YC, Mackenzie received her Masters of Science Degree in Adapted Physical Activity in April 2014. In December 2012, Mackenzie received her Bachelors of Science in Health and Physical Education with an emphasis in Adapted Physical Activity. She attended Slippery Rock University of Pennsylvania for both graduate and undergraduate studies. Mackenzie graduated from Valley Forge High School in Parma in 2008. During her undergraduate and graduate studies at SRU, Mackenzie spent many hours working with individuals of various abilities across the lifespan in physical activity settings. She created and implemented adaptive sports programs, coordinated sports clinics and summer camps for youth who are blind and visually impaired, and supervised undergraduate students for a variety of adaptive programs including a comprehensive transition program for youth with disabilities. In addition to Youth Challenge, Mackenzie is an adjunct professor at Baldwin Wallace University where she teaches an Adapted Physical Activity course. Certifications that Mackenzie maintains are Certified Disability Sport Specialist, Certified Adapted Physical Education Teacher, Adapted Aquatics Assistant Instructor, SafeSport Certification, and Special Olympics Track and Field Coach.